Can we have too many grey or white tee shirts? When Mark Zuckerberg (CEO of Facebook) was asked why he wears the same grey t-shirt every day, he replied saying he actually owns multiple versions of the same t-shirt. Ok, so the reason for him owning so many was because he didn't want to spend too long making a “silly” decision on what to wear, but rather spend that energy towards his products and services (source). Hmmm, maybe we could get more things done if we spent less time on what to wear?? I know when I don't have to time to get ready, I usually throw on a grey or white t-shirt or even a grey jumper, you can't go wrong with that! But can us ladies have too many of the same item? I guess for me, and maybe for a few of you out there, you probably own a few styles of the same colour t-shirt. Whether it's a grey or white t-shirt, I think you can never have too many. 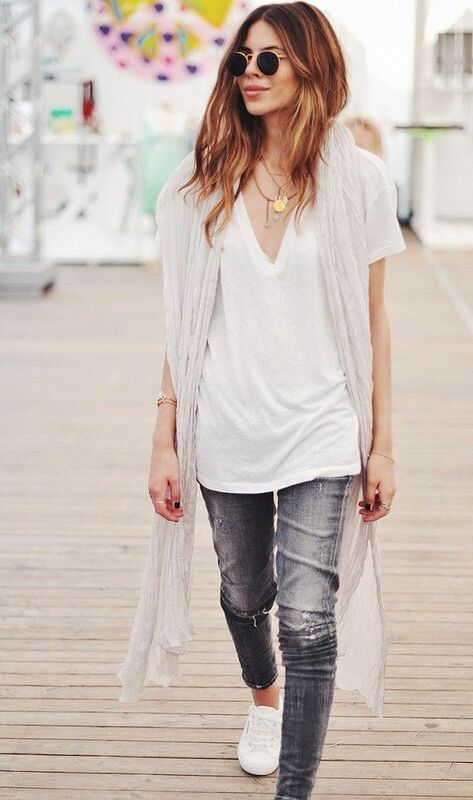 Here are a few grey and white t-shirt looks from Pinterest.